Emma and Dexter. Dex and Em. Em and Dex. Their graduation turned into a drunken night where Emma took Dexter home and they spend the night making out, smoking cigarettes and talking. When they part the next day, they promise to be friends and the book follows them on the same date, 15th of July – St Swithin’s Day, for the next twenty years. I have been arguing for myself for a year now whether I should read it or not, but a friend gushed so much about it that I had to give it a try. This book was not life-changing for me, I felt that I have read/seen it before. But it was exactly what I needed in these dark November days, so I have enjoyed reading it, although the plot was too easy to guess and it is so full of clichés. However, I’m really looking forward to seeing the film as the book is a good script for a romantic film and I adore Ann Hathaway. This book also reminded me a lot of the Marriage Plot by Jeffrey Eugenides, so if you have read One Day and liked it, I highly recommend the Marriage Plot. 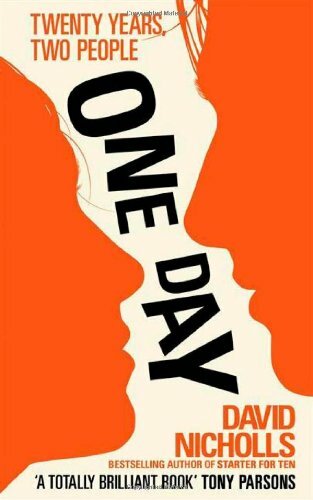 And if you’re considering reading One Day, read the Marriage Plot instead.